If you love creamy pasta dishes but have avoided making them in the past because the recipes seem too complex, we think you’re going to find that this dinner is totally doable and absolutely delicious. It packs much more flavor than any sauce from a jar and is every bit as tasty as the one from your favorite Italian restaurant. While you could substitute garlic powder and dried basil, we think the fresh garlic and fresh basil leaves add so much to the flavor and presentation of this dish. It might not completely replace the joy of going out to your favorite Italian trattoria, but being able to whip this dish up on your own (any time you feel like it) is a pretty close second! Cook noodles according to package directions. Drain and rinse pasta. Slice each chicken breast in half lengthwise. Place the sliced breasts, 1 teaspoon lemon juice, lemon zest, salt and 1/4 teaspoon of pepper in a bowl and toss to coat the chicken. Heat olive oil in a sauté pan over medium heat. Add the chicken and cook until lightly browned on each side and cook through. Remove chicken from the pan, cut into cubes, and set aside. Place milk, Italian seasoning, bouillon cubes and remaining pepper in a large pot. Bring it to a simmer over medium-low heat, cook for 4-5 minutes, then turn off heat. In a second large pot over medium heat, melt butter, then whisk in garlic and flour, stirring to create a roux. Add milk mix to the roux slowly, stirring with a whisk to eliminate any lumps. Bring to a simmer and continue cooking until sauce thickens. Remove pot from heat. Stir cheese in until melted and smooth, then add remaining lemon juice. 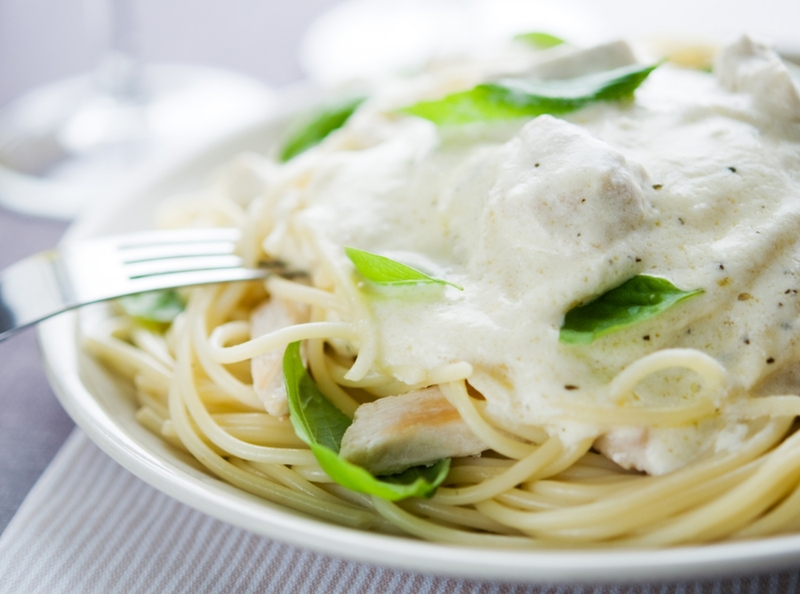 Serve hot with pasta topped with chicken and cheesy sauce. Garnish with fresh basil leaves and enjoy!